My mother-in-law lives in Hemet, CA and has many pine trees, two of which are mature and completely dead. Two other mature pines are partially dead. 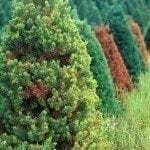 Brown needles on the top and most branches but with one to three branches which are green and look healthy. Can they be saved? Do you know the varieties and, other than brown needles, are there any other signs of problems, such as bugs or anything like that? This information will help us diagnose the trees.